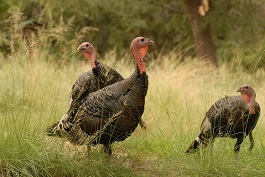 PHOENIX – The Arizona Game and Fish Department has scheduled a series of six “open houses” for its constituents to review and ask questions about proposed hunt recommendations for spring hunts for turkey, javelina, bison and bear. The department annually makes recommendations to the Arizona Game and Fish Commission regarding the management of game species, which establish the seasons, dates, bag limits, open areas and permit-tag allocations based on the framework of the hunt guidelines set by the commission every two years. Wed., July 26: 3-5 p.m., Tucson, 555 N. Greasewood Road. Thurs., July 27: 4-6:30 p.m., Mesa, 7200 E. University Drive. Mon., July 31: 3-5 p.m., Pinetop, 2878 E. White Mountain Blvd. Mon., July 31: 3-5 p.m., Yuma, 9140 E. 28th St.
Tues., Aug. 1: 5:30-7:30 p.m., Flagstaff, 3500 S. Lake Mary Road. Tues., Aug. 1: 3-5 p.m., Kingman, 5325 N. Stockton Hill Road. The proposed hunt recommendations will be presented to the commission for consideration during its Aug. 4 meeting in St. Johns.